The Home Place is your home away from home. 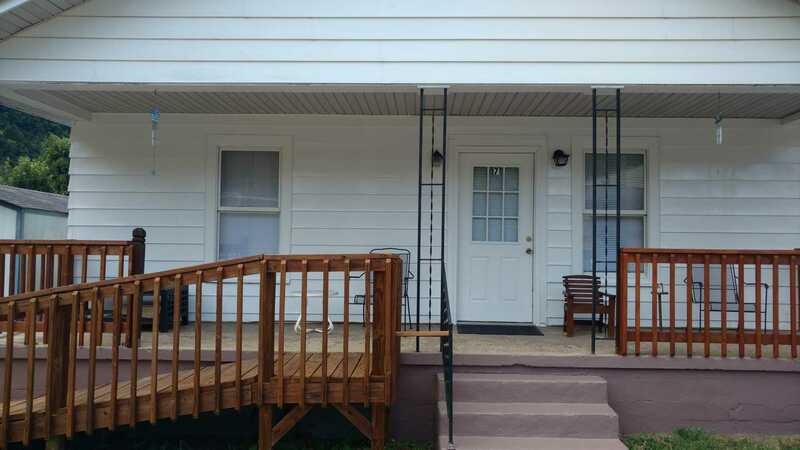 Once you pull up to the property, you’ll be greeted by a large front porch with seating. Inside, you’ll find the original wood flooring that has been refinished. A large living room contains a couch, futon, rocking chair, and a Queen Anne chair. There is a 43″ inch TV for viewing your favorite shows and sports while you’re taking a break from riding the Hatfield-McCoy Trail System. The home is equipped with wireless internet, so you can be connected if needed. If not, please unplug it and enjoy a vacation free from your computer, cell phone, and tablet. There are 3 bedrooms — two with full size beds and one with twin beds. Including the couch and futon, there is sleeping room for up to 8 people. The home has one bathroom with a full tub/shower. There is a dining room and fully equipped kitchen if you want to cook while you’re here. There is a separate changing area, stand-up shower, and washer/dryer for you to change out of those muddy riding clothes before you enter the house. There is a separate parking area for your trailers and ATV’s. This parking area is gated and is equipped with security cameras. There are 2 restaurants within walking distance and the closest trail head is Rockhouse. Please visit our website to check availability and book your reservation. We think you’ll find the Home Place truly your home away from home!